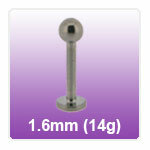 Facial monroe piercing labret studs made from steel and Titanium in 14 gauge size (1.6mm). Labrets with internal and external threaded ends. "Great products really like my new bioplast bars. Would have liked more choice on the balls. Not all the balls on the site can be added to the build..."